Peak Performance Special Events and Ice Breakers. 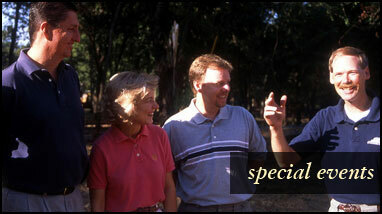 Let us arrange unqiue special events for your company which will teach teamwork and leadership skills. Why Gamble That People Will Meet Each Other When We Guarantee It! People are coming from different places across the country, the world, or maybe just different departments, and you want them to �get to know each other.� Forget about the usual standing around in a stuffy conference room, looking for anybody you might know in a sea of unfamiliar faces and awkward conversations about nothing, pretending to have fun in your crazy party hats episode. Instead, take on our fun, energizing, worth your time, no holds barred festivity of real fun, real celebration, and meaningful interactions! A highly orchestrated series of activities that ensures each participant meets at least half of the group in a meaningful way. Participants can relax and enjoy themselves as they move through fun and energizing activities. Verbal Dancing can happen inside or outside, and with groups of any size. Engage a diverse audience of multiple intelligences from visual spatial to logical mathematical persons in your social mixer. How? By handing over a stimulating and intense venture that requires participation from all kinds of folks. Participants create physical representations of a theme, and then integrate their own projects with other groups. Get outside and cool off. A series of competitive and collaborative activities that offer pure fun, and guarantee participants get to know each other better. Activities engage different learning styles, as well as a range of multiple intelligences. Available anywhere there is water, and a place to spill it! This program gives everyone a chance to help create the organizational masterpiece, and take home a reminder to anchor the experience for better retention. The program begins with a series of highly active teambuilding activities that mix competition and collaboration, and insure that everyone gets to know each other in new and interesting ways. These activities build to a climax project,The Portrait by the Masters. Small groups complete 4 x 8 foot �paint-by-number� panels using a fun and interactive team process. The mural is assembled by our staff �behind the scenes.� Participants view the mural in its entirety (12� x 24� or larger) for the first time as they gather for dinner, an awards banquet, breakfast, a kick-off for the next day, or any significant large group event. Since the concept (painting by numbers) is widely understood, there is little �prep� or �intro� time, and participants are actively engaged from the beginning to a climactic ending. The integration of company symbols (logo or theme), and the tangible and lasting memory of an 8� x 10� keepsake copy, makes this event live on in the minds and hearts of the participants. This project has a lasting impact on participants in many ways. They internalize the concept of being an important individual part of an immense organization. Employees feel more connected to the company as a whole, and more connected to each other. Leadership principles and the elements of high achieving teams are intertwined in the process of painting. Participants learn while doing and having fun! 288 sq. ft. Assembled Mural or Larger! In this second phase of information gathering, teams will be given a compass bearing (azimuth) and the general dimensions of the search area. The teams gain points for each clue found, plus they will gain valuable knowledge for future success. Using knowledge gained from a brief map and compass lesson, teams will navigate to the victim�s �point last seen,� and follow clues from there to locate their missing person. Teams will improvise a �rescue litter� using materials provided, and transport the �victim,� a container of water, through an obstacle course back to rescue headquarters. A �reporter� from the media will interview each team. Responses are videotaped and made available for viewing by the entire group at a subsequent session. Participants in Peak Performance!��s Everyone�s a Star� experience teambuilding of epic proportions by creating their own film. During their program, the group produces a short finished movie. Maybe �Lord of the Rings� took longer, but it sure doesn�t have anything over these productions! Team members fill the roles of Director, Camera Person, Sound Engineer, Makeup Artist, Dialogue Coordinator, Continuity, Writer, and other critical positions. And with limited time, �on-camera� editing, and virtually no budget, the pressure is on. � A promotional �ad� about the company�s product or service. Often, a dinner or evening activity following the program provides time for a screening of the teams� productions. Participants receive a video incorporating all of the teams� videos, and a multi-media montage offering reminders of other major program components.